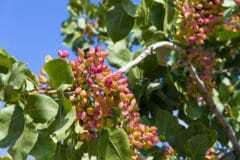 Do Trees Grow Pistachios? 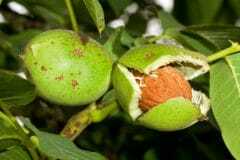 Yes, but Nut Trees They’re Not! 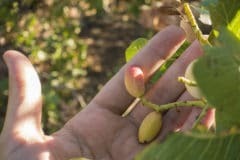 What do pistachios grow on? To put it in a nutshell, they grow on trees. 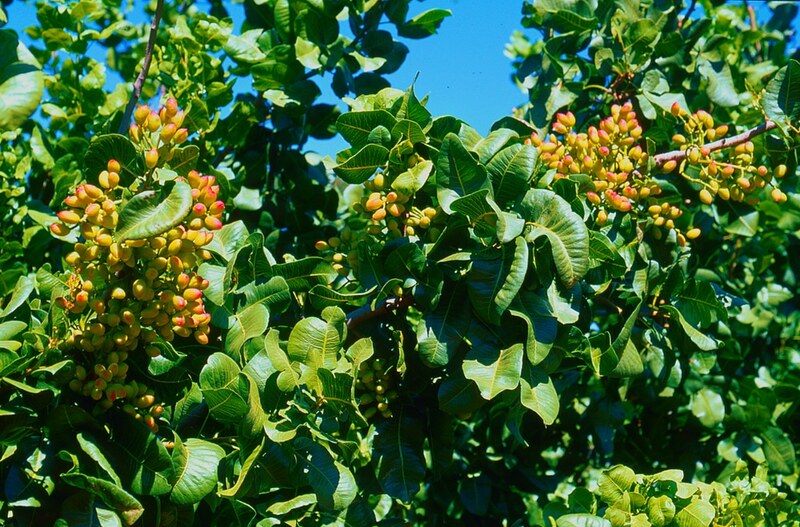 In the United States, pistachio trees (Pistacia vera) are grown commercially in limited parts of USDA 7b through 10, where their tolerance for heat and marginal soil – not to mention their ultra-nutritious and delicious harvest -- makes them commercially viable. But a true nut harvest, it’s definitely not! 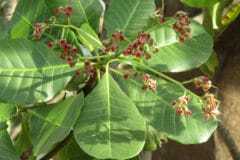 Leathery, deep-green compound leaves measuring 4 to 8 inches long with three to five rounded leaflets. Gray bark that darkens and cracks as it ages. Dense umbrella canopies. They make pistachios excellent shade trees. But the trees’ most important feature is their unusual fruit. 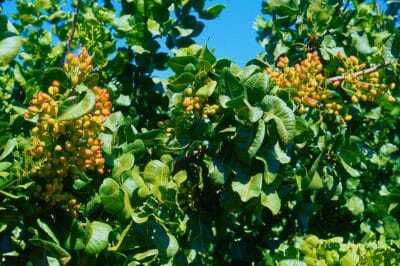 As members of the Cashew (Anacardiaceae) family, pistachio trees produce clusters of fruit resembling miniature mangoes. Each mini-mango hanging from the ends of their branches contains a single seed. The seed is what we commonly call a pistachio nut — but a true nut is something quite different. Why is a pistachio not a true nut? The answer lies in the way it peeps out from inside a shell that opened while still on the tree. 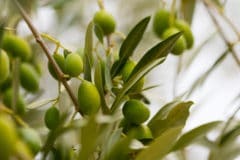 The shells of true nuts never open without outside help. Acorns, beechnuts and hazelnuts are true nuts; pistachios are the seeds of fruits known as drupes. Drupes are fruits with pulpy flesh surrounding a hard shell that holds a single seed. Some drupes, such as apricots, peaches and plums, are grown for their sweet, juicy pulp. 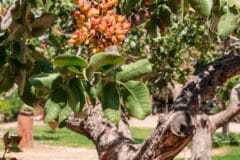 Pistachios, almonds, cashews and walnuts are drupes grown for their seeds. Expert gardener’s tip: A layer of mango-scented, reddish-purple pulp covers each pistachio seed, but there’s too little to bother eating. The right combination of winter chilling hours and summer heat so the trees could flower and fruit. 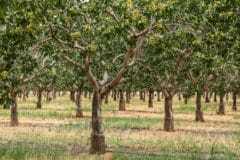 Forty to 50 gallons of water per tree per day while the nut kernels developed. Enough wind to carry pollen between compatible male and female trees. And that’s just some of the effort behind every tiny, delectable pistachio nut! 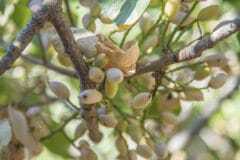 Where Do Pistachio Nut Trees Grow? 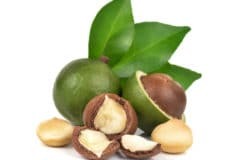 How Do Macadamia Nuts Grow? Slowly — But They’re Worth the Wait! 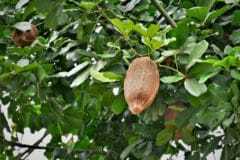 How Do Brazil Nuts Grow? Only with Nature’s Helping Hand! 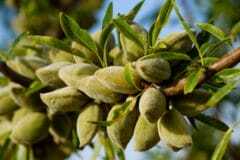 Where Do Almond Trees Grow? 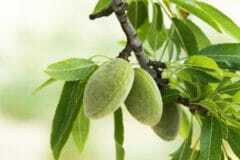 How Do Almonds Grow? The Answer Might Surprise You!